With its Sanskrit meaning of “good smelling,” this ancient Indian spice was considered extremely valuable, and once used by the Romans and English to pay their taxes. This light brown seed has a nutty, earthy, spicy and bitter taste with a penetrating warm and slightly lemony aroma. 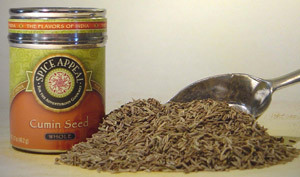 Dry roast seeds for a more intense aroma and added flavor to Indian and Sri Lankan curries. A popular ingredient in Mexican, Cuban and Tex Mex cooking. Use to flavor chili con carne, enchiladas, rice, egg dishes and burrito fillings.